Coopers and Coffee is quickly approaching and volunteers are needed. Please comment below with which opportunities you would enjoy doing. Thank you so much for lending a hand to make this event fun for everyone! You do not have to be showing your car to volunteer! All club members are welcome to lend a hand. Staging cars at the initial meetup point, getting cars grouped in the order they will be displayed at the show and dispatched by group. Cyclists to guide each group from the staging area to the show display area. Short, relatively flat back and forth between the staging area and the show area multiple times. Parking Guides to assist cars with parking in their assigned spot in the display area. Registration Bag Distribution (bags are labeled with each registrant's name and will include t-shirts pre-ordered) Two MINIs with large boots would be preferable. Attendees will come to your car to collect their registration bag. 9:30 to 10:30 a.m.
T-Shirt distribution for those not showing a car at the show. (Club logo shirts pre-ordered, packaged with the Miniacs name, available for pickup at your MINI.) This would be divided by two people, one taking 10 a.m. to 12 Noon, the other taking 12 Noon to 2 P.M.
2. (12 Noon to 2 P.M.) Laurie S.
Raffle Ticket Sales. This is perfect for someone who is outgoing, comfortable handling cash and checks. Y Raffle tickets are sold only to club members, not to the general public at Food Truck Brunch. Super Duper Raffle Ticket Sales and Display. A club member has generously created a true work of art, a piece of KC MINI Club memorabilia that is one-of-a-kind. This item requires two people to carry through the show and sell raffle tickets specific to this item. The item will be on display inside the Bean Hangar for the duration of the show, easy to pick it up and return to its display space when it's time to sell raffle tickets from 11:30 to 12:30. 1. Cathy and Richard V.
Raffle Item Attendants. New this year, instead of the raffle items being in the back corner of the show lot, we have been generously given space by The Roasterie to have the items on display inside. The items need to be attended from 11 a.m. to 1:30 P.M. at which time the winners will be drawn and attendees will be permitted in to see what they have won. Please note when signing up to volunteer for this position if you may also be comfortable selling raffle tickets, as we could have volunteers selling tickets both in the car show area and by the raffle items. Cleanup. Perhaps the most important volunteer spots, making sure everything is tidy in the car show area, any trash collected, all tables in the raffle area put away, any unclaimed registration bags and t-shirts returned to me. 2 to 3 P.M. I will volunteer for one cyclist spot and one cleanup spot. I can do both t-shirt distribution slots and cleanup. See below for new choice. Last edited by Laurie on Thu Sep 20, 2018 7:55 pm, edited 1 time in total. I’ll be glad to do the T-shirt distribution for those not in the show. 10:00-noon if it’s not taken. If so I’ll do the later shift. 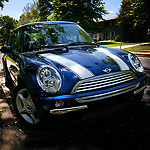 Currently motoring in "Sweet Caroline" our 2009 Mini Cooper convertible. We can do t-shirts or cleanup. Larry would actually NOT like to do parking. He can do clean up with me. We both can also do A 11-11:45 raffle attendant slot since I'm not doing both t-shirt pickups. Cool? Last edited by Laurie on Thu Sep 20, 2018 7:48 pm, edited 1 time in total. Charlie Farmer will do either ticket sales or raffle attendant. I am not good at making choices, and I am directionally challenged. But I would be more than happy to help out. Just tell me what to do where to go and when to be there. Also if you tell Brian he will point me in the right direction. I can do the parking guide. 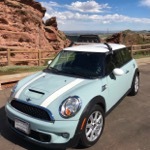 I’m assuming I will just park my Mini in its spot vs going to the staging area. I can also help out taking the art work around if needed. I can do registration bags again or I can sell raffle tickets! I can hang with the raffle items from 12:30-1:15. I will volunteer to do the last raffle prize slot, 1:15-2:30. I'm signed up to start cleanup at 2 but Larry can fill in for me until I get there. What time do you need the volunteers to meet at the Roastery?